Yesterday, while attending a late lunch with friends from work, I hit upon the notion of a new extreme sport: toilet skydiving. 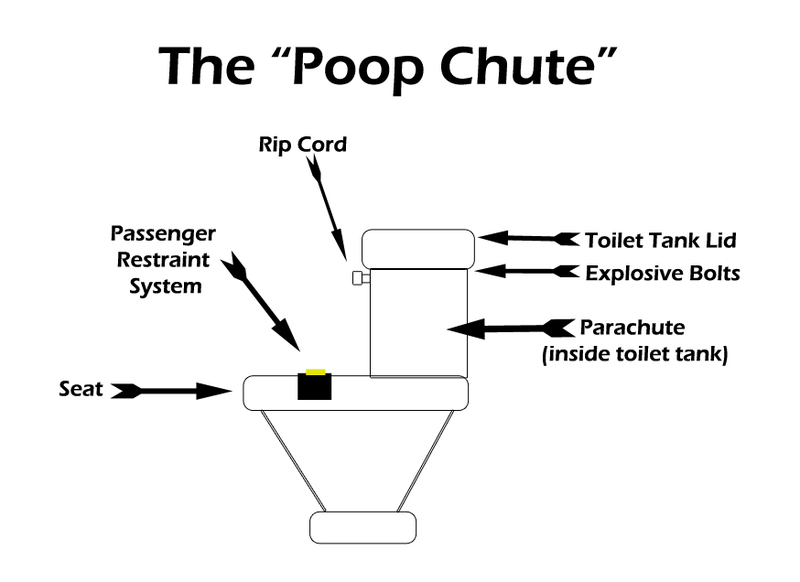 The idea is simple: pack a parachute into the tank of an ordinary toilet, with its straps affixed to the inside of the tank. Mount explosive bolts to the toilet tank lid, triggered when the toilet is flushed. Affix a seat belt to the toilet seat to ensure that the skydiver remains securely attached to the toilet. During a typical flight, the Sky Toilet and passenger will be ejected from a suitable aeroplane at regulation skydiving altitude, either pushed through the cabin door, or, ideally, dropped through a set of bomb bay doors. Either way, the skydiver can free fall while seated, providing unprecedented comfort and serenity during the experience. At the appropriate altitude the diver flushes the toilet, firing the explosive bolts and releasing the parachute. Toilet and skydiver float gently to earth, landing softly while seated on this innovative porcelain chariot. My colleagues offered no objections, though to be honest they didn't seem to be listening that closely. But I see no reason why this shouldn't become a popular new extreme sport.